For the past couple of years , except the previous one, I have climbed several mountains out in Colorado, U.S. These have been some of the best and most rewarding experiences of my life. Climbing to the top of the world is not an easy feat to say the least. It is both physically and mentally challenging climbing up a giant hill for several kilometers. There can be jagged cliffs, loose boulders, altitude sickness and many other issues to overcome to reach the summit. However once there, all the physical exertion used to get you there is well worth it, peering from the top of the world over the surrounding landscape with clouds floating on by. Being in Japan last year, it was my dream to try and climb Mount Fuji, which is a well known symbol of Japan. However the planning, time, and money did not quite work out when Elise came to visit. Thus this time I started persuading Elise a bit earlier to take on such an adventure. 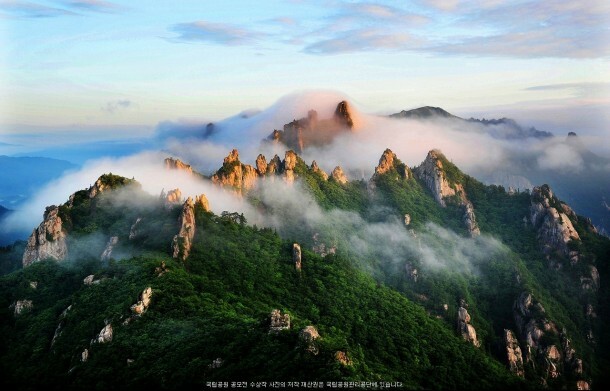 In the Seoraksan National Park there are quite a few mountain peaks with the tallest being the Daecheongbong peak with an altitude of 1,708 meters (5,604 ft.) providing for stunning views over the surrounding jagged peaks. Perhaps a bit of encouragement from Elise’s readers will help motivate her to climb the mountain. It sure would make me happy! Click here for some general information about hiking in the Seoraksan National Park, as well as some information on the trails. 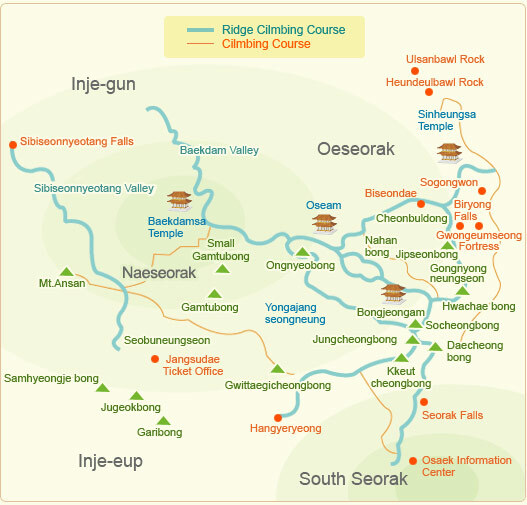 From my research there are two main ways to get to the top of the Daecheongbong peak. Either starting at Sogongwon Ticket Office or Osaek (Namseorak) Information Center. Starting at the Sogongwon Ticket Office provides for a bit more of a challenging hike as the return trip is 20km often over rough terrain and step elevations. However, starting Osaek (Namseorak) Information Center offers a quicker route at 10km round trip. Hopefully after my trip to Korea I can offer you a first hand account of my experience in the Seoraksan national park and climbing Daecheongbong peak. So you better give Elise some encouragement! Elise you should totaly do this!! A new Live experience!